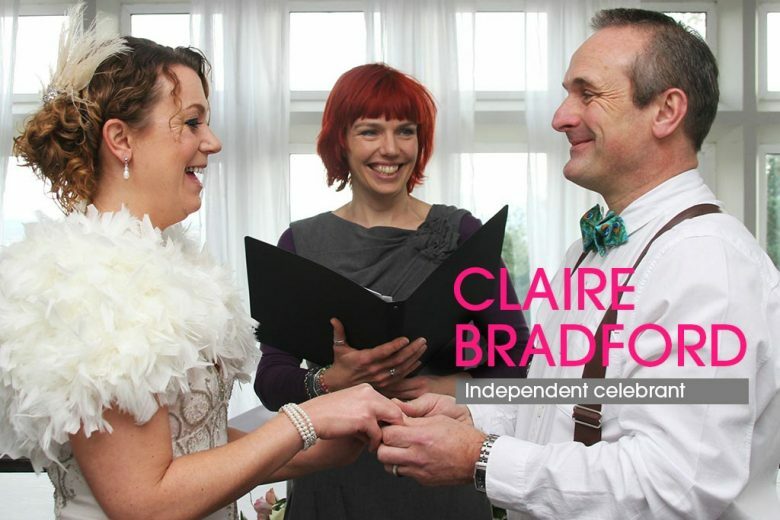 Claire Bradford of Creating Ceremony tells us about her recent big career change from life coach to independent celebrant. First of all, what IS an independent celebrant? Celebrants create and conduct weddings, baby namings, vow renewals, funerals and other ceremonies. These occasions are completely bespoke – there is no ‘one size fits all’ script; each ceremony is written from scratch to reflect the personality, style, interests and beliefs of the client. We are neither priests nor registrars; our ceremonies put the person or people they are for at the centre, rather than God or a legal process (that said, God may be involved if the client would like, but the legal stuff never is!) You can read more here. I started out as an English teacher working first of all in British secondary schools and then moving on to teach EFL in France and then back in Britain. I trained as a life coach when I was pregnant with my eldest daughter and was a coach for the next 14 years before becoming a celebrant last year. Having just discovered that I was pregnant, I was in France with my husband and we were dreaming about ways that we could live over there and work remotely. When we got home from France there was an introductory pack from a coach training institution on my doorstep, which seemed like the answer! My mum had seen an advert for the course and thought it was right up my street so she had sent off for information on my behalf. It seemed like such a perfect fit for me and for our lifestyle. I trained whilst pregnant and set up my business around my eldest daughter when she was a baby. We never did move to France but I really enjoyed the next 14 years of flexible working and being my own boss. Whilst it wasn’t always easy to be self-employed, it was great to be free of set hours, set holidays and someone else dictating how I spent my time. I don’t think I’ll ever go back to being employed again. Where did the idea of becoming a celebrant come from? It’s a funny thing – I did a careers test at university and the results came back saying that I should become a minister of religion, which made me laugh because I didn’t really have faith – a pretty major part of the job! Apart from that small detail(! ), it was a great idea – the role would have suited me perfectly. Four years ago when my father-in-law died I found out about celebrants from the funeral director. Here was the potential to do something like the job that had appealed so many years before and now I could do it without needing to nail my spiritual beliefs to any particular mast. How did you make the move? What really prompted me into training to be a celebrant was when a friend of mine announced that she was getting married. It turned out that she had been having a conversation with some other friends about how I would make a really good celebrant. I think it’s a personality thing – I’m enthusiastic and innovative and I laugh a lot. More conservative people may not want a celebrant with bright red hair, but that’s fine by me – I think of my hair as a beacon for creative types! I mentioned before that I’ve never liked to nail my spiritual colours to one particular mast but I am very open minded on that front and I love to weave people’s beliefs, as well as their stories, through their ceremonies (I particularly enjoy the challenge of incorporating two spiritual or cultural backgrounds into one ceremony). I love working with creative, slightly quirky, passionate types who have an interesting story or unusual ideas. People who are willing to be imaginative and to colour their big day in with their personalities, not just to do whatever is expected and standard. I am a big fan of networking (I’ve written for Talented Ladies Club about this in fact) and so I find that letting people know about what’s possible with a celebrant through my networking groups spreads the word further. I’m also a lover of social media, particularly Facebook, but my favourite thing is just going out and chatting to people at venues and wedding fairs and letting them know about this option available to them other than a vicar or a registrar. I also write guest blog posts so my message can be found all over the Internet! This is quite a new venture for you – how has it gone? I was expecting my first year to be quite quiet and full of learning on the job whilst I got the word out. However, I’ve been amazed at how busy I’ve been with weddings, memorials and funerals. I feel as though I’ve jumped in at the deep end but that I’m really, REALLY enjoying the swim. My original plan was to segue slowly from coaching to celebrancy but straight away the celebrancy has claimed my time and my heart. My best technique so far has been to approach really lovely venues that I want to work with and going to speak with them about how a celebrant can really enhance the weddings they host. They then do my work for me by recommending my services to their clients, so it really works well! I have also had success with making vlogs, including one that I did about leap year proposals and another one that I did for National Storytelling Week. Keeping abreast of what’s current and then making something that is relevant to that and to celebrancy has been really fun and it’s gone down well. A lot of people don’t know about celebrants and therefore I often meet couples who have already booked the registrar and wish that they had known about celebrants beforehand. So I suppose it’s that the word isn’t really out there yet – but then the word wasn’t really out there about coaching when I started. I seem to be very good at joining things just as they’re getting going so I suppose I should be used to it! It’s good to be a trailblazer. When my friend Sarah – the one who first asked me to be her celebrant – walked down the aisle towards me on her wedding day. I had to compose myself because it wouldn’t really be the thing for the celebrant to start crying at the beginning of the ceremony! It was so lovely to see her walking down the aisle so happy and to know that we had worked on a ceremony that was really personal to her and her partner. They took a big gamble by taking on this person that they knew hadn’t done any weddings before and, as well as being such an incredible honour, that gamble changed my life. I think it’s because it makes me feel so fulfilled. I love to hear people’s stories and turn those stories into a ceremony for them. I really get a buzz out of people saying that I have reflected them exactly as they see themselves and created something perfect for them. It’s also important to me to show my girls that you can be a parent and you can have your own business and still have a life. Now that my girls are older (they are 13 and 9) I don’t have the issues of their complete dependency anymore but it’s still important for me to be there for them, and of course I want to spend time with my husband as well. Celebrancy takes up quite a bit of time at weekends so we have had to adjust a little to the change. I am lucky that my husband is also self-employed and therefore we can be flexible around the time that we are at home and with the girls. We are creative about making sure we have some really good quality time by going for walks on the beach together after school drop off for example, as well as declaring some evenings and weekends no-work zones. Actually, I think it’s really made us all more appreciative of the time we all do spend together. What are your top tips for other self-employed types? Create strong boundaries around your work and the rest of your life. These boundaries can change every day but set them consciously (e.g. decide when you will stop before you start) before they take charge of you. Remember that a good networking group won’t only promote you but will also support you and be a great source of advice and inspiration just when you need it – find one that suits you and join. Know your bottom line, not just financially but also (and possibly even more importantly) emotionally, practically and energetically. Do everything in your power to avoid crossing it. It’s all too easy to sacrifice health or time with our loved ones in the pursuit of a work goal but this will almost always cause huge regrets later on. Find out more about Claire’s business, Creating Ceremony on her website. You can also follow Creating Ceremony on Facebook, Twitter and Pinterest and you can sign up for the newsletter here.